Dry open ground. Hill prairies, sandy ground. PA, west through MI, WI, MN, NE, south FL to TX. Perennial, more or less hairy herb. Leaves simple, opposite, sessile or nearly so. 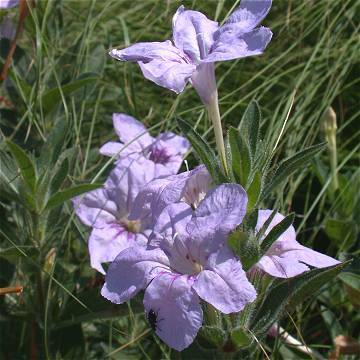 Flowers sessile or nearly so, in cymose clusters from axils of upper leaves; corolla lilac-purple, funnelform, 5-lobed; stamens 4; calyx lobes narrow. A good garden plant that looks nice with low prairie grass like prairie dropseed.